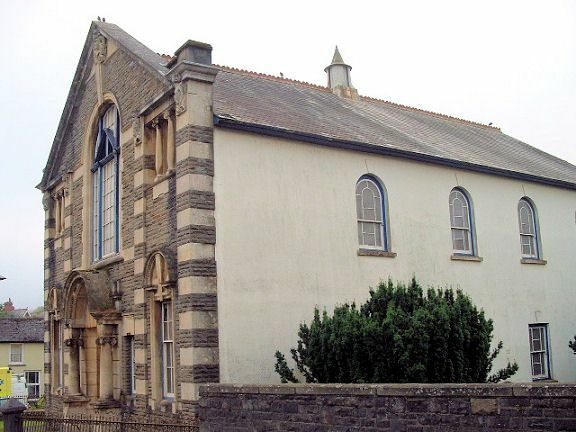 Calvinistic Methodist chapel with a plaque on the front which reads 'Built 1808, Rebuilt 1867, Enlarged 1907'. The present building is the remodelling of 1907 and is thought to be by W Beddoe Rees, architect, of Cardiff. Chapel in Beaux Arts style with 2-storey 3-bay gable-end facade. The front is of rock-faced stone in shallow courses with extensive Bathstone dressings and banding. It has 4 banded pilasters with cartouches at cornice level, the gable treated as a broken pediment. To the centre is a large round-headed window with sill band and impost band, which breaks into the pediment and has a tall keystone linking with a cartouche in the gable apex which reads 'Bethel'. The window is 3-light with transom and small panes, with a triangular motif above the transom. Below the window is a Bathstone portal consisting of a semi-circular hood with dentils supported by Ionic columns on plinths. It contains double half-glazed wooden doors, above which is a Bathstone tympanum with finely jointed voussoirs reading 'Calvinistic Methodist' along with the dates of building and enlargement. Flanking the doorway are small multi-pane windows, each bearing a circle, under substantial Bathstone lintels. The outer bays have at the upper level, 3-light multi-pane windows articulated by Ionic columns, with Bathstone lintels and aprons. On the ground floor are large 6-over-6-pane sash windows in architraves whose tall keystones break into semi-circular pediments. The 2-storey 4-window side elevations are rendered under slate roofs. Metal vent with pyramidal cap to ridge. Round-headed windows to upper storey, square-headed windows to lower storey, all with keystones. The N side retains sash windows with marginal glazing; replacement uPVC glazing to S.
Vestries at right angles to rear, entered from the advanced S gable-end. Slate hung front with three 6-over-6-pane sash windows under segmental heads to upper storey. On the ground floor is a central panelled door with boarding under a multi-pane overlight, flanked by sash windows. Small 4-pane window to E side of advanced front. The N end is rendered, with 3 sash windows to the upper floor and 2 to the ground floor. The chapel is surrounded to the S and E by a low forecourt wall with iron railings with fleur-de-lis finials, gate piers with pyramidal caps, and decorative double iron gates (in the SE corner of the enclosure is a C19 obelisk to the Winston family). The entrance leads into a lobby with timber and glass screen to chapel, and stairs to each side to gallery. Flat boarded and panelled ceiling with deep central decorated rose and moulded plaster cornice. U-plan gallery on iron columns of 2 designs; 3 fluted columns with foliage capitals at entrance end of chapel; round columns with decorated bell capitals towards pulpit. Polished moulded wooden front to gallery, which continues on fourth side below organ loft and supports turned rails. The pipe organ is set within a round arch, flanking which are decorative marble frames containing tablets, that to the L to Parch. Evan Evans. Below the organ is recessed wooden panelling to rear of pulpit, under a segmental wooden arch with keystone. Polished pulpit with canted front, high railings and stairs to each side, all surrounded by a set fawr. To the R of the pulpit is a marble tablet to Parch. Rees Evans (1845-1929). Three banks of pews with doors (those below gallery are canted). Vestry block has hall on ground floor with entrance lobby, panelled doors, wainscot panelling and benches facing a pulpit at the N end. Classrooms etc. upstairs. Listed as a well-preserved chapel of this Edwardian style whose front makes an important contribution to the centre of 'The smallest town in Britain'. The bridge carries the A483 over the River Irfon in the centre of Llanwrtyd Wells. Located near the centre of the town and fronting the road. One of a pair of houses, that to the W modernised. Prominently located in the centre of Llanwrtyd Wells and fronting a small square opposite Pont Rhyd y Ferrau. Located at the SE corner of the Dolwen Fields and surrounded by trees. To the W of Llanwrtyd Wells Station. Situated 0.5km NW of Llanwrtyd Wells between the River Irfon and the mountain road to Abergwesyn. Faces S; path to W leads to former spa buildings. Small station building with large forecourt set below road and sited on the N railway platform. Approx 0.6km SE of the town centre. Set in the grounds W of the Dol y Coed Hotel and approached by footpaths. Immediately S of the Well-House. Set in the grounds W of the Dol y Coed Hotel and approached by footpaths. Immediately N of the former Pump House.